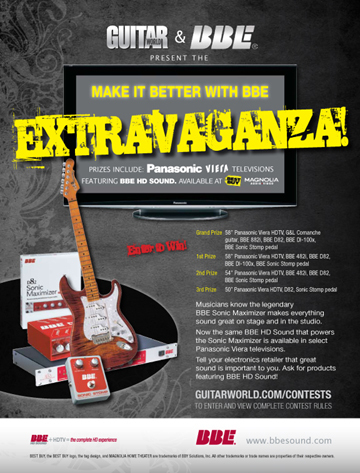 BBE Sound News: Announcing the Make it Better with BBE contest winners! The cool thing is that Trent is heading off to music school soon ... hope the BBE and G&L gear serve you well, Trent! The Olympics were brilliant on the new Panasonic TV. The BBE functionality in the sound makes all the difference! The picture quality is also superb...I am extremely impressed. This Panasonic TV visually and sonically handles every kind of source material very well. I’ve never been so up close and personal with curling, bobsledding, short track, and ice skating in my life. I’ve also been enjoying the BBE 482i Sonic Maximizer. In a nut shell, why didn’t I buy one of these years ago? It’s like a mastering lab in a box. Everything becomes bigger than life. It is so easy to bask in the sonic quality of it all. We get lost in the complexity of the modern studio and forget that sometimes the simplicity of two knobs can change everything for the better and make a world of difference. The BBE Sonic Stomp is excellent for fattening and enhancing distortion, fuzz and overdrive pedals as well as clarifying most anything in the audio chain between the Guitar/Bass and the amp. Also, It is really nice to see a company who understands the simple things, like including a 9v adapter with the pedal.